Saturday, September 15, 2018 - ie tomorrow. But Sunday morning UK time. The fight will be the first event to be shown on BT Sport's new pay-per-view offering, BT Sport Box Office. Canelo v GGG 2 will cost £16.95. Existing BT Sport and BT TV customers can pay using their remote control, Sky customers without a BT Sport subscription can register and pay online at www.bt.com/sportboxoffice and will then be able to use their remote to subscribe to subsequent events. It's happening 12 months longer than most boxing fans would have hoped, but on Saturday night, the world should finally receive a decisive answer to the question of who is the better boxer between unified middleweight champion Gennady "GGG" Golovkin (38-0-1, 34 KOs) and Canelo Alvarez (49-1-2, 34 KOs). The two fought to a controversial split decision back in 2017, and they were expected to fight again in May. Alvarez was suspended six months and not cleared to fight at that date, though, after the Mexican power puncher failed two steroid tests that he claimed were triggered by the inadvertent ingestion of tainted meat. -- where we take an in-depth look at the world of boxing each week. In the meantime, Golovkin brutalized Vanes Martirosyan on that May date, setting the stage for Saturday's fight. 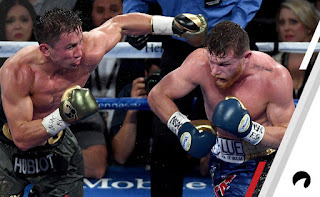 Not only are Golvokin's unified WBA (super), WBC and WBO middleweight titles on the line, he and Alvarez will be fighting for the vacant Ring and lineal middleweight titles.